Musical Theater Performances from 2004 & a Holiday Preview – Show This Weekend! Join us at the Derry Opera House this Sunday at 4 p.m.! Fabulous music from Sondheim’s The Frogs, Assassins and Pacific Overtures, Children’s Letter’s to God, bare, Brooklyn, Fiddler and much, much more. Come catch some of the music of 2004’s Broadway and off-Broadway seasons performed by some of our finest performers. 29 W. Broadway, Derry. As always, no one is ever turned away (whether you can make the suggested donation or not), so grab your friends and come catch the show! And if you haven’t marked your calendars for our tour, Something Wonderful I Missed: Holiday Edition arrives this December! You can catch our professional troupe December 6th in Meredith, December 7th in Littleton – AND on Tuesday, December 16th, join us for an incredible dinner & wine pairing at Amphora in Derry! In other words, this will be the best dinner theater performance EVER. Tickets are available here, or visit Amphora in Derry to purchase! Hope you can join us soon, and thanks! 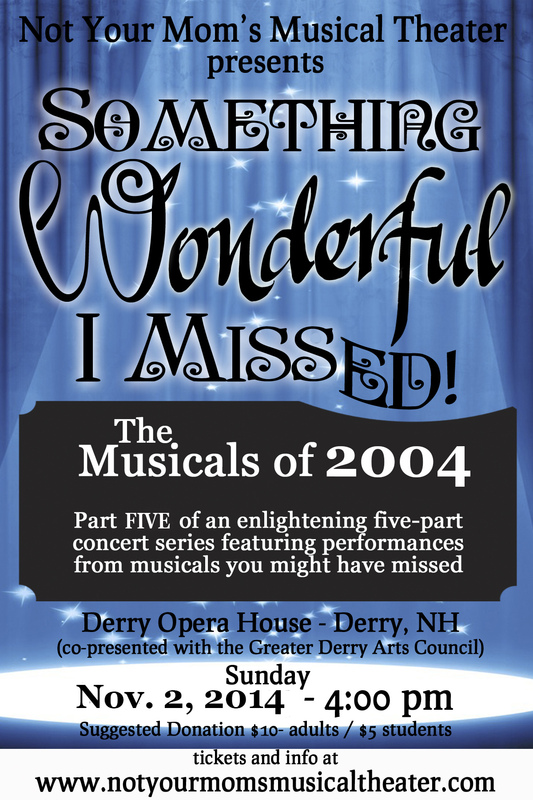 Join us for Something Wonderful I Missed: The Musicals of 1994 This Sunday! Something Wonderful I Missed: Holiday Edition Tickets Are Up!